One Ring To Rule Them All: the story of Tolkien’s ring. Finders, keepers, as Gollum might say. Two thousand years ago, a great bustling Roman city was mysteriously abandoned. No-one knows why all the other Roman cities were adopted and survive, yet this one simply crumbled and was covered by earth two thousand years ago. It’s just muddy farmland now. And in 1785, a farmer was ploughing when something caught his eye. A gold ring. A treasure from the lost city of Calleva Attrebatum. And when it was cleaned up it was found to have an inscripton on it. “Seniciane, vivas iin de”, it says. Senicius, live in God. The spelling is unconventional. The story of how the ring got to a house ten miles away is not told. It is assumed the farmer sold it to the prosperous family who lived at The Vyne, Basingstoke. But there it has sat ever since, until some bright spark realised that the cult following created by the film versions of The Lord Of The Rings and The Hobbit would come a long way to see something like this. Their reasoning? JRR Tolkien knew all about this ring. And about the chance find which reveals it to be accursed. Eighty miles from The Vyne, in Lydney, Gloucestershire, there is a great old mound which locals have feared for a thousand years. Dwarf’s Hill is riddled with tunnels and open cast mines. Locals have for centuries believed it is inhabited by little people; dwarves and hobgoblins. Sited in the estate of Lydney Park, it has a rather enchanted air itself, masquerading on a sunny day as Middle Earth. But once it was a Roman settlement, and in 1929 the renowned archaeologist Sir Mortimer Wheeler was busy excavating a temple found there. The temple was dedicated to the Roman God Nodens. Aka: Lord of the Mines. So one day Sir Mortimer’s team were digging and they found a tablet. It was inscribed: “For the god Nodens. Silvianus has lost a ring and has donated one half [its worth] to Nodens. Among those named Senicianus permit no good health until it is returned to the temple of Nodens.” The eminent archaeologist is said to have made the connection between the tablet and the ring at the Vyne, and called in Tolkien to help. The author was professor of Anglo-Saxon at Oxford University at the time. He was asked by Wheeler to investigate the etymology surrounding the ‘Nodens’ in the curse. He even wrote a chapter for Wheeler’s subsequent book. The provenance for Tolkien’s complex mythology is a constant subject of debate. He acknowledged the greek tale of Oedipus and the Finnish Kalevala as influences and scorned the ‘fundamental unreason’ of Celtic folklore. But nowhere, to my knowledge, is there any shred of a word from him about the influence on his stories of this old Roman ring and the curse on which he must surely have worked. Time has stubbornly refused to tell. Posted in Literary lives, Places to visit, Quirks of HistoryTagged archaeology, Calleva Attrabatum, Dwarf's Hill, JRR Tolkien, Lord of the Rings, Lydney Park, mythology, Ring of Sylvanus, Silchester, Sir Mortimer Wheeler, The VyneBookmark the permalink. Part of the power of the ring, no-one knows unless the ring wants them to know. It is a seductive trinket, when all is said and done…. Sad that we’ll never know for sure, Roger. Have you thought about trying to contact Christopher Tolkien to ask about this? If anyone is able to shed any light on a possible connection, he’d be the one. Glad to hear it, Miss W , and what a pleasure to have you visit here! Thank you for popping in to read. Thank you for this fascinating tale! Pleasure 🙂 It was just fin to go along and see it in its element, so to speak. There are so many things that tie up, aren’t there, Madhu? Quite! There is plenty of fire. Next stop is to get to Lydney Park to see that barrow! It’s all there for the taking, isn’t it? Curses, mines, dwarves, a ring… Thanks for investigating and reporting back! It is a lovely ring, isn’t it? Is it, or isn’t it. Methinks it might be. I didn’t know there was a “fundamental unreason” to Celtic folklore. I’m puzzled. That is a beautiful ring. It looks magic. Eek – Tolkien’s opinion, Gale, not mine! He could be a little sniffy about mythologies, evolved or created. If I remember rightly he would not take CS Lewis’s Narnia seriously -said it was filled with too many pieces of obvious symbolism, and far too many elements which clashed. Tolkien Lewis-ly, I find Narnia more credible than Miggle Erf. I sometimes think of hiding some random items in far out of the way places for people in the future to find and wonder about :-). I was so fascinated while reading this I had to read it twice, Kate, to be sure I hadn’t mixed fiction with fact. It’s such a fabulously intricate tale and the imagination does leap to fill in the possibilities. I’m left a bit agog! This story has always fascinated me since I first heard it a few years ago. I loved the way that two objects, separated by the Bristol Channel, could combine to give the outline of a plausible tale. 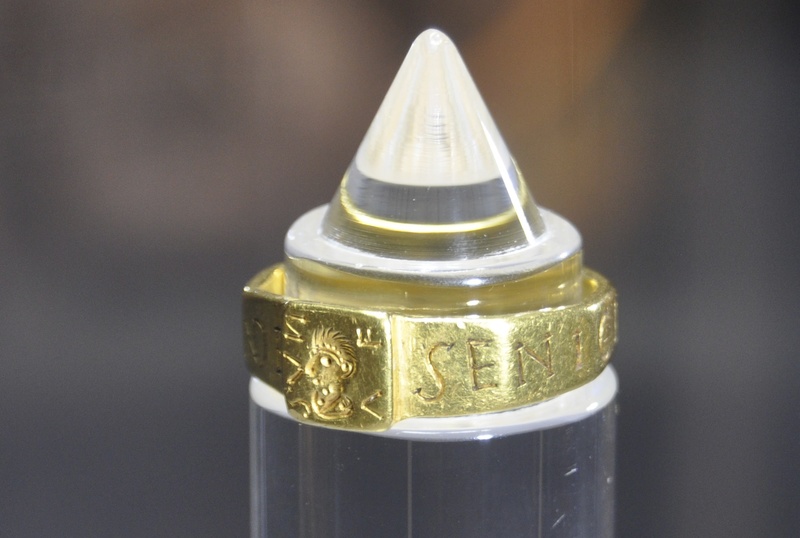 It’s certainly a nice conceit that Tolkien may have been influenced by this ring’s back story in the creation of Gollum’s Precious, especially by the fact that it has writing on it. But it’s that one fact, isn’t it, a ring with writing on it, coupled with the Tolkien association. It could easily have been a silver spoon (several of which have been found in Roman hoards with names on them) or a cup or some other inscribed object that drew a curse on the thief. And then we wouldn’t have the romance or the wonder because we would be clutching at straws. And yet while my head says ‘It’s pure coincidence’ my heart says ‘It’s one amazing coincidence!’ Our brains are hard-wired (so my psychologist wife tells me) to look for patterns, and we wouldn’t be able to function if we weren’t always trying to find significance in the patterns we detect. This might belong up their with the tale of The Maltese Falcon. Wonderful story, Kate. If it’s cursed though, it should be returned to its rightful place.